Another downtown business concern has completed the installation of a new, attractive front. Bergin Bros., located at 206 West Main Street, has undergone a complete face lifting. Lannon stone and Fond du Lac stone were used in the construction of the front. There are aluminum framed windows, on a slant, and an aluminum frame door, a 13 foot canopy also is of aluminum. The installation was made by Janczak Aluminum & Glass Company of Beaver Dam. The front was designed by Stephen Bergin and his son, Tom. 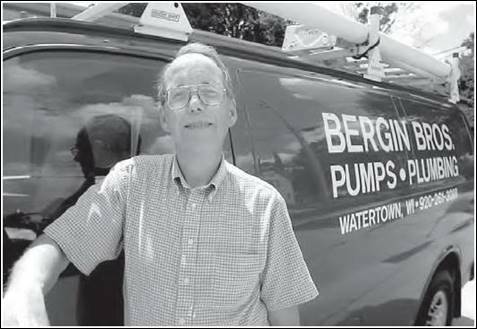 Bergin Bros, is a well-known Watertown business. It has been located at 206 West Main Street since 1945, and before that the operation was carried on at the family farm in route 6. Partners in the operation of the store are Stephen and Basil (Bill) Bergin. The firm offers wafer systems, softeners, heaters, pumps, plumbing supplies, kitchen sinks and cabinets, electric motors, bulk milk coolers and many other items. Plans for a new front were in the making three years ago, but the installation was held up until the new street paving was placed so that elevations would not have to be changed. In the installation of the front, steps have been eliminated. The front is most attractive, and provides another distinct improvement to Watertown’s business area. The renovation project also includes the painting of the upper area of the building. The building at one time housed the Grand Hotel, a well-known early day hostelry in Watertown. Bergin Bros., Inc. has been at its current location for 63 years. It is a third generation family-owned business starting on a farm south of Watertown in 1931. The business was purchased by Tom Bergin in 1978. Prior to that, the business was owned by his father and uncle from 1946-1978. There are currently four employees. Bergin Brothers is a licensed pump installer and they employ three master plumbers. Bergin Bros., Inc. is a contracting, service and retail business. They offer repair, remodeling, new construction of plumbing for residential, commercial and industrial applications. They also provide well pump and water system installation and service.